Harry David Chambers married Bonnie May (?). Harry David Chambers was born on 2 March 1897 at Missouri. He was the son of William Aubrey Chambers and Mary Josephine Newkirk. Harry David Chambers died on 18 October 1973 at California at age 76. [S245] U.S. Federal Census 1900 U.S. Federal Census, by Ancestry.com, Year: 1900; Census Place: Willow Fork, Moniteau, Missouri; Roll: 876; Page: 12B; Enumeration District: 0091; FHL microfilm: 1240876. [S244] U.S. Federal Census 1910 U.S. Federal Census, by Ancestry.com, Year: 1910; Census Place: Willow Fork, Moniteau, Missouri; Roll: T624_800; Page: 4A; Enumeration District: 0104; FHL microfilm: 1374813. [S243] U.S. Federal Census 1920 U.S. Federal Census, by Ancestry.com, Year: 1920; Census Place: Roy, Mora, New Mexico; Roll: T625_1077; Page: 10A; Enumeration District: 119; Image: 842. Bonnie May (?) married Harry David Chambers, son of William Aubrey Chambers and Mary Josephine Newkirk. Bonnie May (?) was born in 1905. (?) Richardson married Bonnie Lee Chambers, daughter of Aubra William Chambers and Bessie L. Foster, before 1977. Name Variation Elizabeth M. Foster was also known as Lizzie. Married Name 21 May 1917 As of 21 May 1917,her married name was Porter. 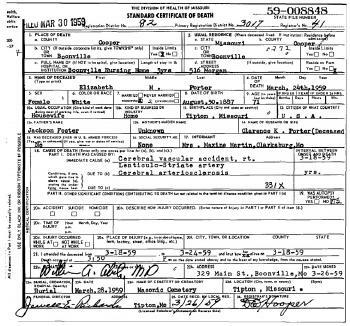 Elizabeth M. Foster was born on 30 August 1887 at Tipton, Moniteau, Missouri, also reported as Jan 1888. She was the daughter of Jackson Grant Foster and Matilda Jane Randall. 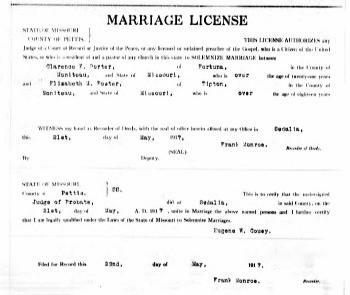 Elizabeth M. Foster married Clarence K. Porter on 21 May 1917 at first marriage for both, Sedalia, Pettis, Missouri. 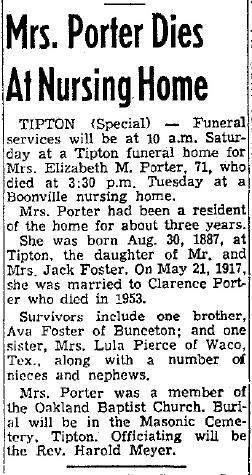 Elizabeth M. Foster died on 24 March 1959 at Cooper, Missouri, at age 71 Mrs Elizabeth M (Foster) Porter obituary. 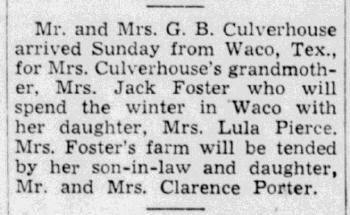 In October 1946 Mrs Jack Foster will spend the winter in Waco with her daughter Mrs Lula Pierce. The farm will be tended by her son-in-law and daughter, Mr and Mrs Clarence Porter. [S245] U.S. Federal Census 1900 U.S. Federal Census, by Ancestry.com, Year: 1900; Census Place: Willow Fork, Moniteau, Missouri; Roll: 876; Page: 3A; Enumeration District: 0091; FHL microfilm: 1240876. [S244] U.S. Federal Census 1910 U.S. Federal Census, by Ancestry.com, Year: 1910; Census Place: Willow Fork, Moniteau, Missouri; Roll: T624_800; Page: 6A; Enumeration District: 0104; FHL microfilm: 1374813. [S243] U.S. Federal Census 1920 U.S. Federal Census, by Ancestry.com, Year: 1920; Census Place: Mill Creek, Morgan, Missouri; Roll: T625_935; Page: 2B; Enumeration District: 124; Image: 998. [S250] U.S. Federal Census 1930 U.S. Federal Census, by Ancestry.com, Year: 1930; Census Place: Mill Creek, Morgan, Missouri; Roll: 1213; Page: 9A; Enumeration District: 0006; Image: 948.0; FHL microfilm: 2340948. [S373] U.S. Federal Census 1940 U.S. Federal Census, by Ancestry.com, Year: 1940; Census Place: Willow Fork, Moniteau, Missouri; Roll: T627_2130; Page: 5B; Enumeration District: 68-18. 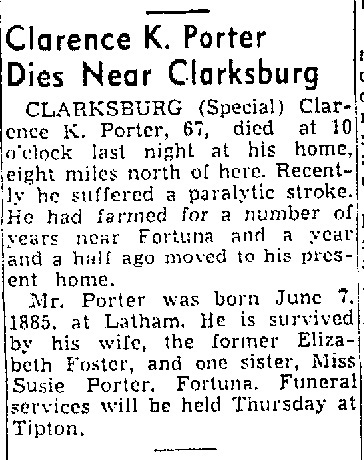 Clarence K. Porter was born on 7 June 1885 at Latham, Missouri, also reported as 01 Jun 1885. He married Elizabeth M. Foster, daughter of Jackson Grant Foster and Matilda Jane Randall, on 21 May 1917 at first marriage for both, Sedalia, Pettis, Missouri. 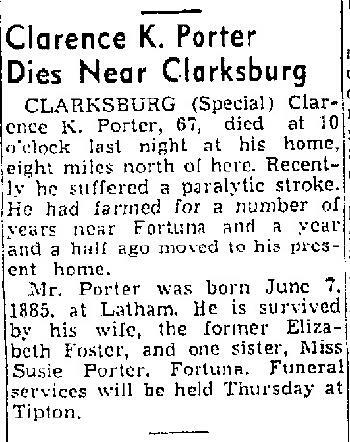 Clarence K. Porter died on 9 March 1953 at Missouri at age 67 Clarence K Porter obituary. Ava Jay Foster was born on 7 January 1885 at Carthage, Newton, Missouri, also reported as May 1885. He was the son of Jackson Grant Foster and Matilda Jane Randall. Ava Jay Foster married Eulala Dell Bond on 9 November 1908 at California, Moniteau, Missouri. Ava Jay Foster died on 1 December 1959 at Missouri at age 74 Ava J. Foster, 74, retired farmer of Bunceton, died at 3:45 pm Tuesday at St. Joseph's Hospital, Boonville, where he had been a patient four days, following a three year illness. Mr. Foster was born at Carthage, Mo., Jan. 7, 1885, the son of Jack and Jennie Foster, and at the age of two went with the family to Tipton, spending his early life in that community. On Nov. 9, 1908 he was married to Miss Eulala Bond. They resided on a farm near Bunceton for nearly twenty years and moved into Bunceton a year ago. On Nov. 9 last year they celebrated their golden wedding. Mr. Foster is survived by: His wife, seven sons, Marvin E., Leroy E., Fred B., and James R. Foster, all of Boonville, William B., Speed, L.J., Columbia and Robert J. Foster, Columbia; four daughters, Mrs. Gertrude Purvis and Miss Barbara Foster, Boonville, Mrs. Virginia Forsee and Mrs. Dorothy Nelson, Bunceton; 23 grandchildren; 16 great grandchildren; one sister, Mrs. Lula Pierce, Waco, Tex. The body was taken to the Richards Funeral Home, Tipton, where funeral services will be at 2:30 pm Friday, the Rev. Bob Ropp, Bunceton, will officiate. Pallbearers will be John and Jack Foster, Leroy Ivy, Clyde Stewart, Paul Huffman and Gordon Waivel. Burial will be in Bunceton Masonic Cemetery. (The Sedalia Democrat 2 Dec 1959). [S243] U.S. Federal Census 1920 U.S. Federal Census, by Ancestry.com, Year: 1920; Census Place: Willow Fork, Moniteau, Missouri; Roll: T625_935; Page: 4B; Enumeration District: 118; Image: 885. [S373] U.S. Federal Census 1940 U.S. Federal Census, by Ancestry.com, Year: 1940; Census Place: Palestine, Cooper, Missouri; Roll: T627_2100; Page: 1A; Enumeration District: 27-20. Married Name 9 August 1909 As of 9 August 1909,her married name was Pierce. Married Name 9 August 1909 As of 9 August 1909,her married name was Pearce. Lula Mae Foster was born on 13 February 1890 at Fortuna, Missouri. Lula Mae Foster married William Howard Pearce, son of Joshua Perry Pearce, on 9 August 1909 at California, Moniteau, Missouri. 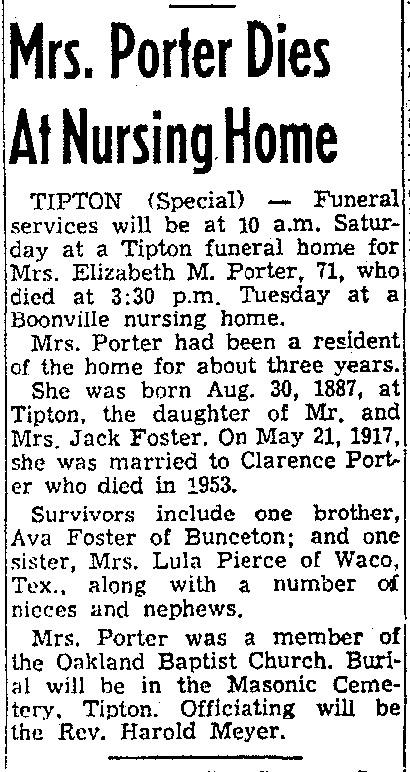 Lula Mae Foster died on 21 April 1963 at Waco, McLennan, Texas, at age 73 Death Certificate for Lula Mae (Foster) Pierce. Lula Mae Foster had 7 with 6 living based on birth certificate of Harold Jackson Pierce children. 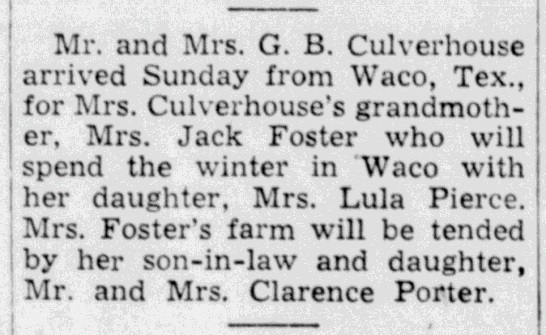 In October 1946 Mrs Jack Foster will spend the winter in Waco with her daughter Mrs Lula Pierce. The farm will be tended by her son-in-law and daughter, Mr and Mrs Clarence Porter. She lived in 1959 at Waco, Texas. [S243] U.S. Federal Census 1920 U.S. Federal Census, by Ancestry.com, Year: 1920; Census Place: Galveston Ward 12, Galveston, Texas; Roll: T625_1806; Page: 7B; Enumeration District: 58; Image: 356. Name Variation William Howard Pearce was also known as Howard. Name Variation William Howard Pearce was also known as Pierce. William Howard Pearce was born on 31 December 1887 at California, Moniteau, Missouri. He was the son of Joshua Perry Pearce. William Howard Pearce married Lula Mae Foster, daughter of Jackson Grant Foster and Matilda Jane Randall, on 9 August 1909 at California, Moniteau, Missouri. William Howard Pearce died on 1 September 1973 at Missouri at age 85 also reported as before 1940 (based on census of wife). Married Name 9 November 1908 As of 9 November 1908,her married name was Foster. Eulala Dell Bond was born on 3 April 1890 at Moniteau, Missouri. She married Ava Jay Foster, son of Jackson Grant Foster and Matilda Jane Randall, on 9 November 1908 at California, Moniteau, Missouri. Eulala Dell Bond died on 15 March 1978 at Bunceton, Cooper, Missouri, at age 87 Eulala (Bond) Foster obituary. Name Variation Earsal Howard Pierce was also known as Howard. Earsal Howard Pierce was born on 14 April 1910 at Missouri. Earsal Howard Pierce married Exa Lena Seale before 1936. Earsal Howard Pierce died on 10 April 2003 at Texas at age 92. He was buried after 10 April 2003 at Royse City Cemetery, Royse, Rockwall, Texas. Married Name before 1936 As of before 1936,her married name was Pierce. Exa Lena Seale was born on 25 January 1916. She married Earsal Howard Pierce, son of William Howard Pearce and Lula Mae Foster, before 1936. Exa Lena Seale died on 14 June 1980 at Texas at age 64. Jerry Robert Farrar was born on 31 October 1942 at Texas. He died on 10 September 2007 at Texas at age 64. Joshua Perry Pearce was born on 10 October 1854 at Tennessee also reported as Oct 1852. He died on 26 June 1936 at Missouri at age 81. Name Variation Jefferson A. Randol was also known as Randall. Name Variation Jefferson A. Randol was also known as Randal. Jefferson A. Randol was born in 1829 at Missouri. He married Catherine Bowen, daughter of Thomas L. Bowen and Jemima Newkirk, on 31 May 1847 at Moniteau, Missouri. Jefferson A. Randol died before 1880 at Missouri. [S249] U.S. Federal Census 1850 U.S. Federal Census, by Ancestry.com, Year: 1850; Census Place: Moreau, Morgan, Missouri; Roll: M432_408; Page: 226A; Image: 14. [S248] U.S. Federal Census 1860 U.S. Federal Census, by Ancestry.com, Year: 1860; Census Place: Township 44 Range 16, Moniteau, Missouri; Roll: M653_634; Page: 739; Family History Library Film: 803634. [S247] U.S. Federal Census 1870 U.S. Federal Census, by Ancestry.com, Year: 1870; Census Place: Marion, Newton, Missouri; Roll: M593_795; Page: 420A; Image: 381572; Family History Library Film: 552294. Marvin Estil Foster married Gladys Frances Bishop. Marvin Estil Foster was born on 19 October 1909 at Missouri. He was the son of Ava Jay Foster and Eulala Dell Bond. Marvin Estil Foster died on 23 July 1963 at Missouri at age 53. Name Variation Elbert Leroy Foster was also known as Leroy. 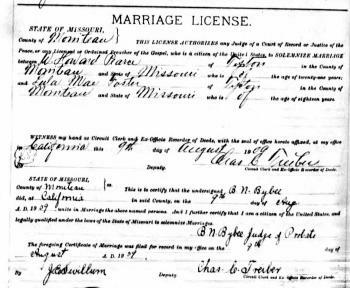 Elbert Leroy Foster married Mabel Missouri Fletchers. Elbert Leroy Foster was born on 11 March 1911 at Missouri. Elbert Leroy Foster died on 19 August 1987 at Missouri at age 76. Name Variation William David Foster was also known as David. William David Foster married Mary Frances (?). William David Foster was born on 27 December 1912 at Missouri. William David Foster died on 1 February 1993 at age 80. Name Variation Anna Gertrude Foster was also known as Gertrude. Married Name Her married name was Purvis. 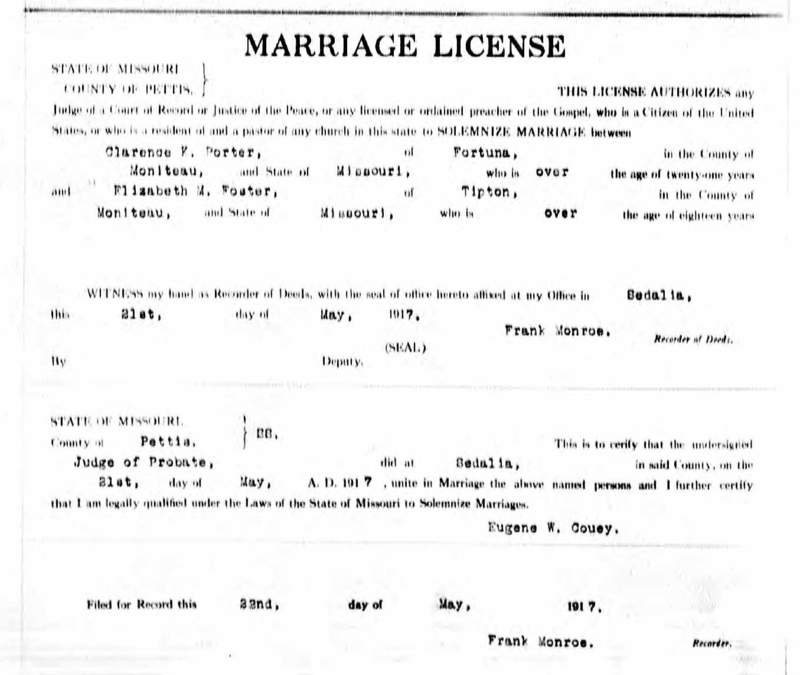 Anna Gertrude Foster married Gregory P. Purvis. Anna Gertrude Foster was born on 19 March 1915 at Missouri. She was the daughter of Ava Jay Foster and Eulala Dell Bond. Anna Gertrude Foster died on 6 March 2002 at age 86. Gregory P. Purvis married Anna Gertrude Foster, daughter of Ava Jay Foster and Eulala Dell Bond. Gregory P. Purvis was born in 1915. Married Name Her married name was Forsee. Virginia Rose Foster married James A. Forsee. Virginia Rose Foster was born on 2 November 1916 at Missouri. Virginia Rose Foster died on 9 March 2004 at Missouri at age 87. 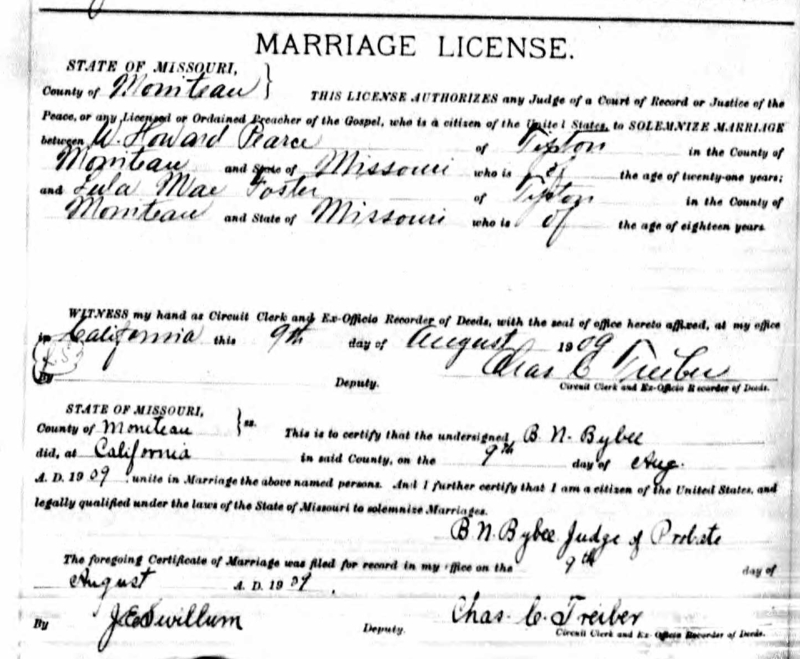 James A. Forsee married Virginia Rose Foster, daughter of Ava Jay Foster and Eulala Dell Bond. James A. Forsee was born in 1912. Dorothy Agnes Foster married John Edgar Nelson. Dorothy Agnes Foster was born in 1920 at Missouri. Dorothy Agnes Foster died in 2002. John Edgar Nelson married Dorothy Agnes Foster, daughter of Ava Jay Foster and Eulala Dell Bond. John Edgar Nelson was born in 1918. Name Variation L. J. Foster was also known as J. L.
L. J. Foster was born on 3 March 1924 at Morgan, Missouri. L. J. Foster married Margaret June Carpenter on 15 January 1948. L. J. Foster died on 25 April 2009 at age 85 L.J. Foster, 85, of Boonville, died April 25, 2009, at his home. Visitation will be held at Davis Funeral Home in Boonville on Wednesday April 29, from 6 to 8 p.m. with a Masonic service at 6 p.m. Funeral services will be held Thursday, April 30 at 11 a.m. with burial to follow at Walnut Grove Cemetery in Boonville. Memorials are suggested to the American Heart Assoc., Walnut Grove Cemetery or Boone Hospital Home Care and Hospice. James Reed Foster was born on 9 January 1928 at Cooper, Missouri. James Reed Foster married Dorothy Jean Schenewerk on 20 May 1950 at California, Moniteau, Missouri. James Reed Foster died on 12 July 1995 at age 67 James Reed Foster obituary. 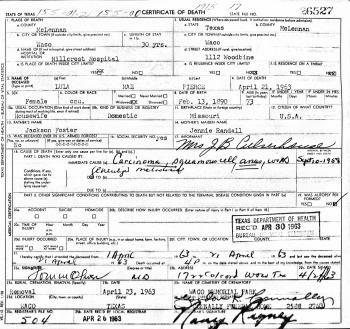 Married Name 19 August 1961 As of 19 August 1961,her married name was Lang. Barbara Jean Foster was born on 28 August 1934 at Missouri. Barbara Jean Foster married Raymond J. Lang on 19 August 1961. Barbara Jean Foster died on 6 February 2003 at age 68. Raymond J. Lang was born on 12 July 1928. He married Barbara Jean Foster, daughter of Ava Jay Foster and Eulala Dell Bond, on 19 August 1961. Raymond J. Lang died on 9 August 2013 at age 85. Name Variation Ethel May Pierce was also known as Ethel Mae. Married Name Her married name was Culverhouse. Ethel May Pierce married Jack B. Culverhouse. Ethel May Pierce was born on 2 December 1912 at Iowa. Ethel May Pierce died on 30 June 1979 at Waco, McLellan, Texas, at age 66. Dorothy Dalton Pierce was born on 19 March 1923 at Texas. Dorothy Dalton Pierce died on 6 December 1935 at Texas at age 12. James Floyd Pierce was born on 11 November 1926 at Texas. James Floyd Pierce died on 6 November 1988 at age 61.